LINDAU, Germany - German Federal President Christian Wulff criticized countries such as Greece and the United States for failing to confront banking, fiscal and debt problems, which has added to the world's economic woes. "For many years, many countries kept putting off dealing with problems by raising public expenditure, accumulating debts and issuing cheaper money," Wulff said at Wednesday's opening of a four-day conference of Nobel laureates on economics and young economists. "At the same time, countries were consuming and speculating on a grand scale." Wulff said it has become abundantly clear in recent weeks in Europe and the US that the banking and debt crisis has tested politicians, governments and central banks to the limit, adding that the challenges are immense. But when commenting on the countermeasures governments have implemented, he said: "Many measures are controversial." Wulff recalled that when the crisis broke out nearly three years ago, a global consensus was quickly reached. Stimulus packages on an unprecedented scale were adopted, and with taxpayers' money, state guarantees and massive monetary transfusions by the central banks, there was a rush to aid the financial sector and banks. "But today, however, the banking sector is still fragile. Public debts in the major economies are at record levels and in many cases the fundamental problems hindering growth and competitiveness are as present as ever," said Wulff. He concluded that governments and the financial sector neither dealt with the causes of the crisis nor can they recognize the risks or act fully to minimize them. "We really are still faced with a development which resembles a game of dominoes," said Wulff. First the banks rescued other banks and then states rescued banks, and now a community of states is rescuing individual states. 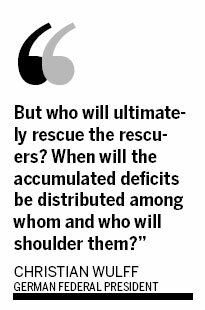 "But who will ultimately rescue the rescuers? When will the accumulated deficits be distributed among whom and who will shoulder them?" Wulff asked. The president's questions were heard by 17 Nobel laureates and 359 highly qualified young economists, meeting to discuss the future of economics as a discipline, the sustainability of healthcare and old-age welfare systems, and the development of labor markets. More than 20 young Chinese economists have registered to attend the event. Joseph Stiglitz, 2001 economic sciences laureate, said: "While the world is still reeling from the financial crisis and widespread economic uncertainty continues to exist, the need for a new economic outlook is more pressing than ever before." Countess Bettina Bernadotte, president of the Council for the Lindau Nobel Laureate Meetings, said: "We are meeting to engage in academic dialogue on economics which unites generations and cultures. In light of the complexity of and interaction between our societies, this dialogue is more important than ever." Founded in 1951 as a post-war reconciliation initiative, the annual Nobel Laureate Meetings have become an international forum for global academic issues. The meetings on physics, chemistry and physiology/medicine have taken place for 60 years on an annually alternating basis. The first meeting of economic sciences laureates was held in 2004, with further gatherings taking place in 2006 and 2008.